This afternoon's swim. Also, the commitment to staying in good health via exercise is not a "new year's" resolution but should be a decade by decade promise to oneself. 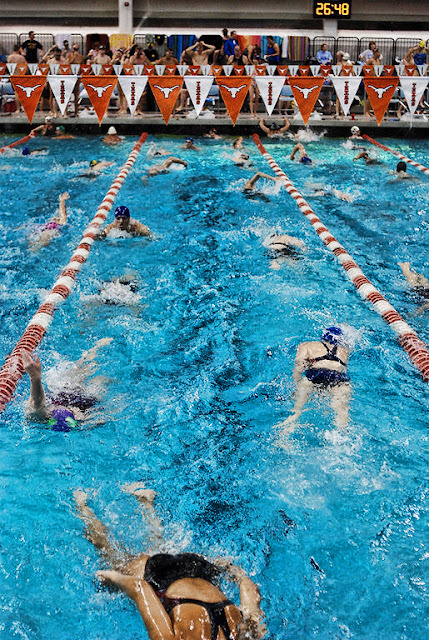 the Jake Jamail Swim Center at UT Austin. Ahhh, the luxury of an indoor pool. I can't shake the image of a bunch of fifty and sixty year old men moving from debating about various cameras to debating the relative "charms" of an exercise treadmill. I think a whole bunch of people either spent too much of their lives chained to desks or they were too easy on themselves, underestimating how much good work a body can do and how invigorating and renewing (physically and spiritully) pushing one's fitness boundaries can be. I'm not suggesting that anyone who has been relatively dormant for decades at a time rush over to a pool and pound out a quick couple of miles in the next hour but I'm very much in favor of people pushing themselves enough to get out of their comfort zones for an hour a day. It was cold in Austin today. We woke up to temperatures under the freezing mark and scattered sleet showers. The wind gusted from time to time and the wetness of the day made it feel chillier than the mercury might suggest. A good day to make a cup of tea and hew to the easy chair to leaf through some books about landscape photography from the 1950's? Not on your life. I worked in the studio until about 11:30 am. The place was in desperate need of a cleaning and with people coming in tomorrow for portraits I had already pushed my self-imposed deadline. With the last bit of vacuuming done I hopped in the new Subaru and headed out to the pool. I left a bit early so I could drop a check by my bank and then some letters to the post office. I got to the (outdoor) pool at ten minutes till noon and changed in the locker room. When I left the locker room the sleet was coming down hard and pelting me in the face. The sleet was also starting to stick to the cold ground. I looked ahead and thought I could see the first little icicles forming on the horizontal bars of the lifeguard's chair. When you are wearing a swim cap, a swim suit and a pair of goggles a sub-freezing temperature and biting windchill factor is ........ bracing. I didn't stop on the deck to chat with my fellow swimmers; we just jumped right into our respective lanes, did a quick couple of hundred yards to get warm and then read the workout that was written on the white board at the end of the pool. There was a thousand yard warm up followed by 12x100 yard swims on 1:30, alternating I.M. 's (individual medley = fly, back, breast, free) and fast freestyle. After that was a set of 12x75 yard swims alternating between one's best (or favorite) stroke and freestyle. After the two sets we had the option to warm down with a two or three hundred yard swim. So, about 3300 yards. During the middle of the workout the sleet storm went bonkers and ice pellets started piling up on the roof of the main building and all over the grounds. The swimmers laughed, plunged under the surface of the 80 degree water and then popped up and kept swimming. A little sleet is hardly anything to worry about. Now hail would be a completely different story. By one we'd finished with our midday swim and were heading to the locker room to change back into our street clothes. But I can still see the little drops that popped up an inch or so above the steaming surface of the pool each time a piece of sleet struck the surface. It was fun and kinetic magic. We swam a hard enough set and got in nearly two miles of swimming over the lunch hour. But this wasn't a "new years resolution" swim for any of us. It was another swim on a massive foundation of previous swims. An almost daily routine for the past 56 years (I started swimming in a year round club at six). It helps keep me right at 158 pounds, keeps my blood pressure and heart rate slow, keeps my joints and muscles happy and improves my general attitude by 1,000 %. It seems like a tremendous advantage to me. Not something I have to sell to myself. In a small business, as in staying in good physical shape, the key ingredient is the discipline to show up and do the work. If you do that everything else falls into place. 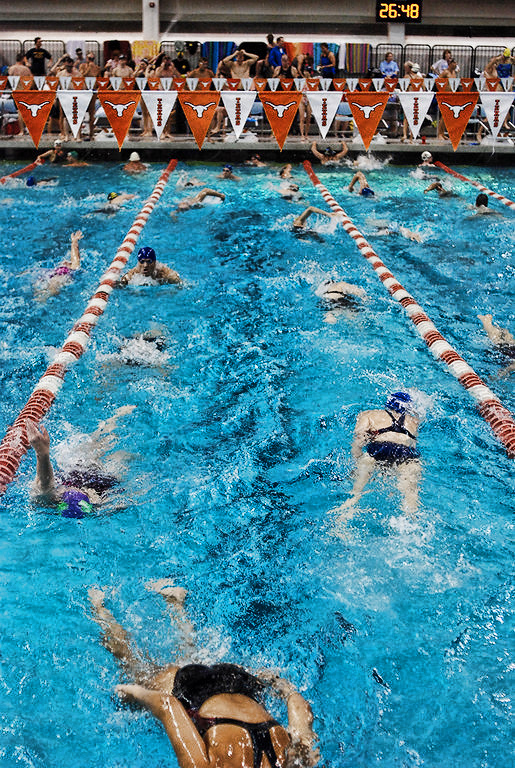 So, what's the real cost of swimming in a six days a week, masters swim program? About $50 bucks for a Speedo Jammer Endurance swim suit and a pair of goggles. If you're good to yourself you'll refresh those basics every year. Then there's the $90 per month dues. That's a total of $1,170. per year. We have workouts that fit most people's schedules: 7-8:15 am, 8:15-9:30 and Noon to 1pm on weekdays and then 7:30 am - 8:30 and 8:30 - 10:00 on Saturdays and Sundays. You can choose one per day or come to all of them, the financial cost is the same. But focusing on one exercise exclusively is not the most productive way to go. I also try to run a five mile trail course a couple times a week and then walk through our downtown area with cameras two days a week. My idea of hell? Sitting at a desk and staring at my computer for eight to ten hours a day. 63 is the new 25. You just have to reset your brain to accommodate for the bad habits of the past. Just about any medical problem you want to bore me with (bad backs, sore necks, insomnia, anxiety) might just be curable with enough exercise. But it starts with commitment. You have to want to make your life better. And who wouldn't? How good is the Eterna Profile in the Fuji XT3? I thought I'd try it out and see. There's a profile in the Fuji XT3 that's called Eterna. It's intended for use as a "straight-out-of-camera" solution for video shooters who don't have the luxury of shooting in a flatter, Log profile and then spending time in post production to color grade the resulting files. It's a flat profile but not in an unattractive way. I decided to see if it was a useable solution for two different shooting situations I encounter; shooting high contrast interiors (usually in a commercial facility) and also making portraits on bright locations. The test shot I am looking at today is from a quick, handheld interior test. 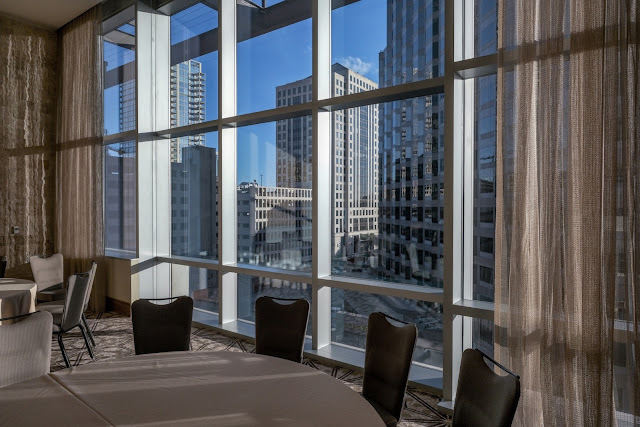 I was in the JW Marriott Hotel on Congress Ave. with my Fuji XT3 and the XF 14mm f2.8 lens and I walked into a room that had floor to ceiling windows on one side which gave me a view of several downtown office buildings; two in full sun and one (on the right side of the frame) that was in full shade. The interior was unlit as the room was not being used. To add to the wide dynamic range of the scene the window supports were brushed aluminum with bright highlights. I switched the camera profile to Eterna and, with the camera set on "fine, jpeg" I proceeded to do a three stop bracket. When I got back to the office I opened the file I thought had the best histogram and took a look. My take was that this profile did a good job maintaining color saturation while giving me a more expansive range of shadow detail (see the shadows of the chair on the table in the foreground or the carpet detail in the far corner) while preserving the highlights in the uprights between the window glass. Given the correct, full daylight exposure on the building mid-frame I think this is a very good result. I would not hesitate to use the Eterna profile in any overly contrasty situation. With a few tweaks to the midrange contrast I get images that seem well balanced and keep me from having to resort to less elegant "tricks" like in-camera HDR. Next time around I'll show you how well it works in portrait settings.